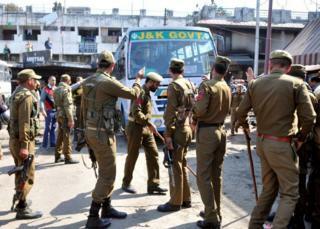 Hizbul Mujahideen has said it was not behind Thursday's attack. "He revealed that he was tasked with throwing the grenade by Farooq Ahmed Bhat, a district commander of Hizbul Mujahideen in Kulgam district," inspector general Manish Kumar Sinha said. India has blamed Pakistan for supporting militancy in the region - a charge Islamabad denies. An Indian fighter jet was shot sot down in Pakistan-administered Kashmir and the pilot was captured. Two days later, Pakistan handed over the pilot to Indian officials establishing a fragile truce.